Ah, Saint Patrick's Day. Debunk your myths here. Celebrate or burn with shame: identity is all about ambivalence towards its history, after all. Speaking of ambivalence, I have just returned from a visit to see family in New England, where Saint Patrick's Day attracts significantly more hoopla than March 17 earns in DC. Every restaurant we walked into, for example, immediately slapped a shamrock sticker on my daughter Katherine. Leprechauns, green streamers, pots o' gold at the end of rainbows having nothing to do with LGBT rights, shillelaghs, and moss colored balloons dangled wherever the eye glanced. Begora was about all I could say. My sister lives in Dover, New Hampshire, in a new house nestled among some older ones. We stay with her when we visit, because (1) she has the space for us and (2) she is not as crazy as some other family members. Dover is a small town that grew along the Cocheco River, mainly as a textile mill flourished in the mid 1800s. Its diminutive "downtown" area preserves the red brick mill, now turned into a modest office building. The center of town is as thick with shopping as an English High Street, and most of these stores have been around for quite some time: a run down music shop, a bakery, a tobacco store, a card shop, a funky coffee house where people still wear tie-dye earnestly. Not far from town center have sprouted the required amenities of twenty-first century American living: Pizzeria Uno, Applebee's, Costco. The center, though, has managed to stay (through no particular effort) noncorporate, without becoming a gentrified or Disneyland version of a New England town such as you might glimpse in Hanover or certain overly precious sections of Vermont. If you are looking for a haberdashery or gourmet chocolate, Dover is not your destination. You will find, though, an unpretentious Irish bar on the water, excellent whoopee pies, and a comfortable Indian restaurant run by a family who converted a storefront. Across the street from my sister's house is a weedy cemetery. Though not the oldest in Dover (there is a "Settler's Cemetery" down the road dating to 1640), the graveyard is impressive: rows of marble and granite-hewn markers, many shaped as angels or crosses or obelisks. My son Alex and I walked through the cemetery when morning sun and white snow rendered the expanse a space where it was hard to think much of death. We squinted to read names, and marveled at the number of markers announcing from which county of Ireland the dead beneath had arrived. We noticed that scores of graves recorded a two year span in the 1860s as dates of death. An epidemic must have carried from life many recent arrivals from County Armagh. Most of them were women. We thought that they must have come to Dover to work at the textile mill, and then perished when whatever fever swept and emptied the brick building. We knew we were being touched by history's receding traces, by stories that we would like to grasp better but that were too distant from us to hold. What did these women leave in Ireland? How frightening and exhilarating was the crossing of the Atlantic? Did the textile mill treat them as badly as the mills of Lowell and Lawrence? Did they die lonely, homesick, afraid? The graveyard in Dover is not especially well tended. An ordinary feature of an ordinary New England landscape, many of the stones have toppled as ice has shifted the earth and wind has pushed relentlessly against their weight. Few of the markers show any sign of memorial visits. The writing is fading beneath lichens, the rock is cracked. The day will come when something else is built upon that space, or when the cemetery reverts to quiet field. Leprechauns, green streamers, pots o' gold at the end of rainbows having nothing to do with LGBT rights, shillelaghs, and moss colored balloons dangled wherever the eye glanced. Faith and begora, Tiny, you *do* look good in a top hat. Oh, and Jeffrey, I own three tie-dyed t-shirts. I decided to wear one today--earnestly, I might add--just because of this post. 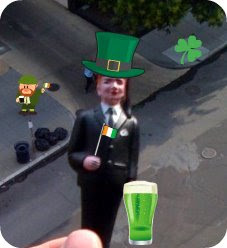 Belatedly, Happy Saint Patrick's Day!! But I'm going to not do a faith & begorrah accent, which feels like an Irish version of the all the recent posts on ethics and hermeneutics! Tiny doesn't have a green bagel in hand? Oh, so disappointing! Oh he has a bagel, it's just under his hat for safe keeping.